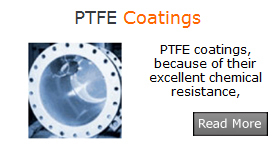 PTFE coatings, because of their excellent chemical resistance, are used in numerous applications by the chemical processing industry. 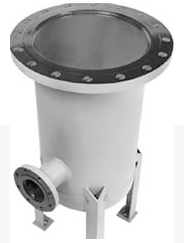 PTFE FEP coatings, PTFE PFA coatings, and TEFZEL ETFE coatings serve as linings in pumps, pipe, tanks, valves, agitators, and a variety of vessels and containers. 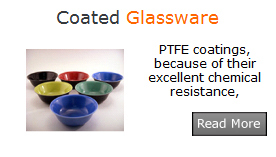 PTFE coatings are chemically inert and solvent resistant to virtually all chemicals except molten alkali metals, fluorine at elevated temperatures, and certain complex halogenated compounds at elevated temperatures and pressures. Chemical and corrosion resistance are not the only properties that are important in CPI applications. Dry lubrication may be required in certain applications. PTFE Industrial coated aerospace applications specify very critical application processes and materials. PTFE coatings can be applied to cup assemblies, retaining rings, carbon rings, piston rings, actuators, valve seat, landing gear and any other moving component on a commercial or military aircraft that can benefit from a dry film self lubricant coating that provides low friction, anti-stick, hydrophobic, oleo phobic, anti-corrosion, and electrically insulating properties. Halar ECTFE is a partially fluorinated semi-crystalline polymer offering a unique combination of mechanical properties, permeation resistance, thermal and chemical resistance, and versatility. Halar ECTFE is a melt processable fluoropolymer manufactured by Solvay Solexis. Its unique combination of properties is credited to its chemical structure, a 1:1 alternating copolymer of ethylene and chlorotrifluoroethylene. Halar coatings provide outstanding chemical resistance. Many of today's pharmaceutical and biotechnology plants must be flexible to produce multiple products while meeting both traditional and growing needs for product purity, cleanability, durability and low maintenance costs. To meet these demands, engineers are turning to piping, components and vessels coated with fluoropolymers; with unmatched chemical resistance, flouropolymers are compatible with just about any pharmaceutical or biochemical process. Traditional stainless steel and glass no longer deliver the best results. Automotive safety system components, from seat belt springs, seat belt tension pawls, lock systems, steering column interlock plungers and many other coated automotive parts have been coated. 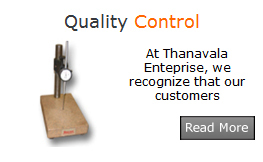 Functional coatings have advanced the reliability and quality of automotive systems. Marine applications such as, corrosion resistant coatings and low-friction coatings on propellers have been successfully accomplished. These searches for greater efficiency and anti-following characteristics, propellers have benefited the quest for both when they are coated with the appropriate high-strength PTFE coating. Applying marine supercharger rotors to increase the air pumping efficiency. prings of all styles and end-use applications are coated by us. We apply all types of coatings specified by our customers including high corrosion PTFE in many colors and formulations, dry film lubricants and specialized noise reducing coatings. We provide coating on arms and ammunition that would hold up under extreme adverse condition to with stand machine gun firing requirements. Our Solvent Base PTFE coating constitutes hybrid silicons W 2626 -10134 series that are chemical highly resistant to high temperature, abrasion & superior corrosion protection. Address : 102, Krishna Kunj, 143, Senapati Bapat Marg, Matunga (W), Mumbai - 400016.